Joel has been playing the piano since the age of seven and has been performing for many years in bands. He now combines his musical talents with the ability to take on the voice and movements of Sir Elton John to put on an amazing stage show. Years of working with audiences from all over the world, on land and sea, has given Joel the experience and confidence to entertain the audience between songs and he even speaks like Elton John. Fully self-contained with own PA and Lights, the Elton John shows can last 45mins, 1hr or 2x45mins so can suit any size event. 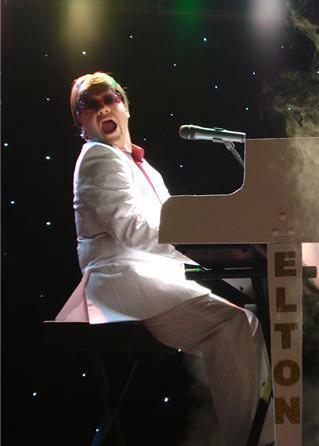 Corporate, Hotels, Parties, almost anywhere you may want to hear Elton's music from the 70s to present day. 'Joel Coombes gave us his tribute to Elton John and very fine it was too. Coombes sports the modern Elton hair-do and actually played his white piano, which is not always the case in tribute-land. Enjoyable for sure.